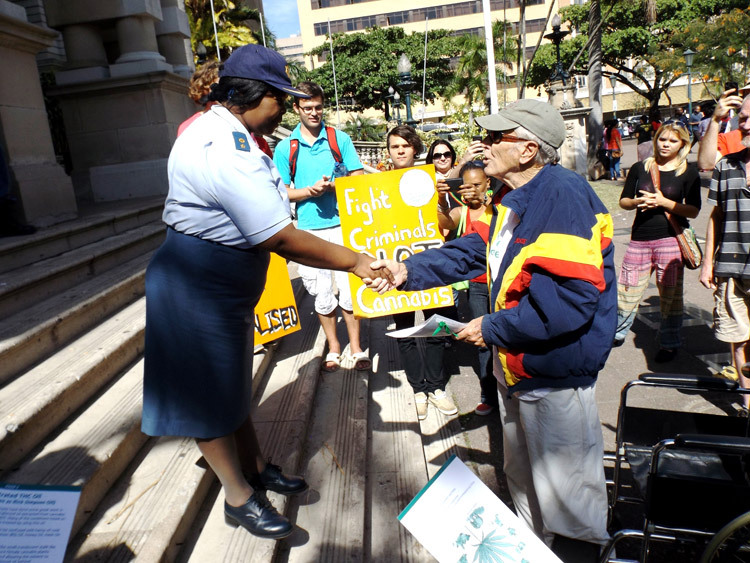 An unlikely gathering of individuals congregated at Botha’s Park, opposite the Durban University of Technology on Berea Road down in Durbs this past Saturday to march for the legalization of the godly green. 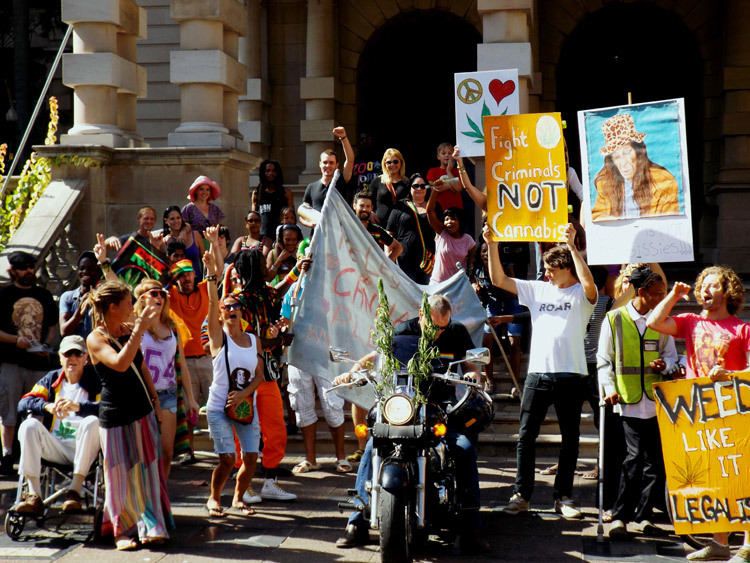 Ganja clouds wafted through the balmy autumn air as Durban’s cannabis culturists made their way to the City Hall. Amid chants of “Free the weed! Industrialize it! We are not criminals!”, regular city dwellers watched with amusement, some even feeling the irie spirit and joining in. 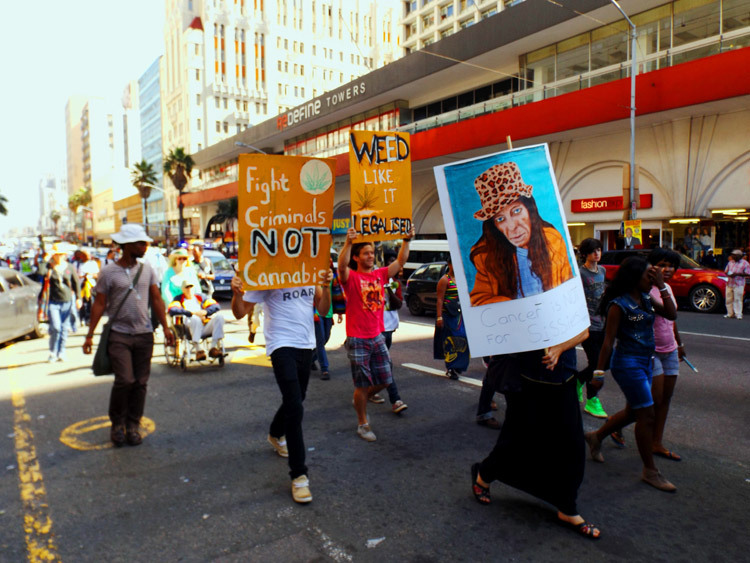 The Durban protest was part of the annual global Cannabis March, which aims at highlighting the medicinal benefits of marijuana. It was just one of about 230 gatherings that took place globally on Saturday. 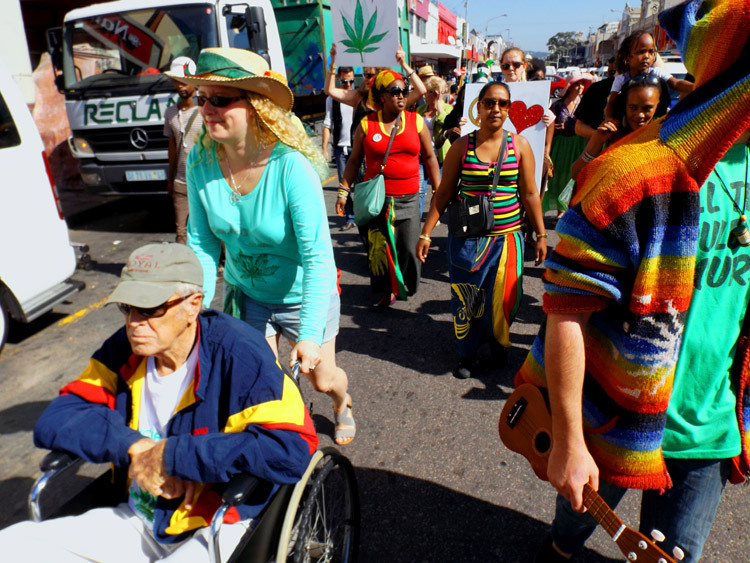 The march was lead by a 77-year-old man called Harry du Plessis, who believes cannabis oil has kept him alive, helping him survive cancer and other diseases. According to an article in the Independent on Saturday, Harry was diagnosed with prostate cancer and cancer of the liver, as well as being a diabetic and having high blood pressure. He was told by the western medical world that he didn’t have much time to live. But his family wouldn’t give up on him, as they searched for alternative solutions and found that cannabis oil could dramatically improve his quality of life and help fight the illnesses. 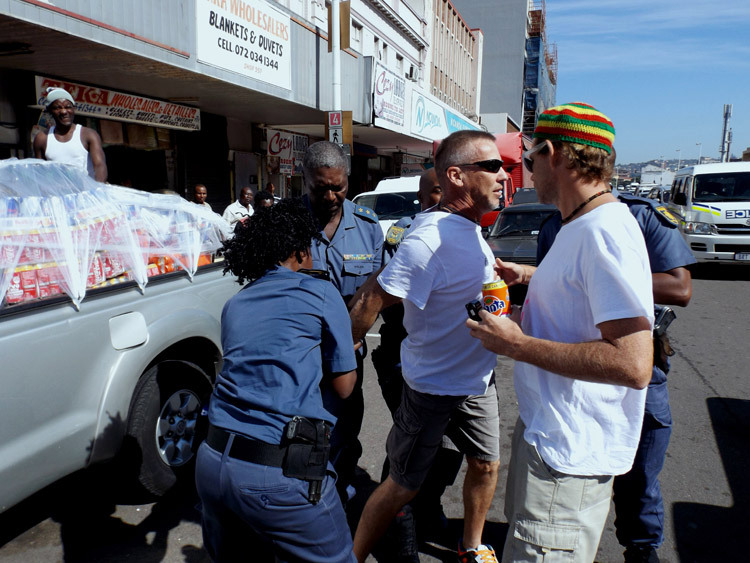 On Saturday, Harry walked in the midst of rastas and hippies, all puffing away as they strolled along Durban’s Dr Pixley KaSeme Street (West Street). 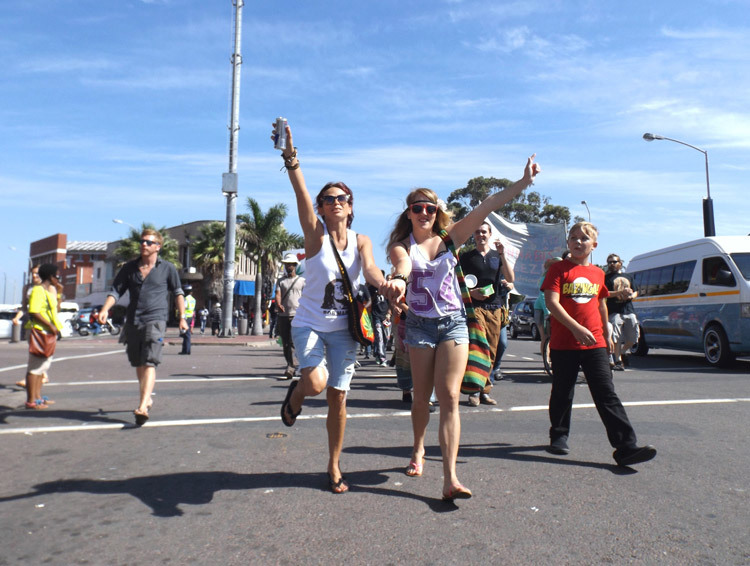 The march was notably small, which was surprising considering the many green-loving people that live in Durban, which is disappointing since a crowd of about 2000 showed up for the march in Cape Town. Most Durban stoners were probably stacking bongs instead of making banners. 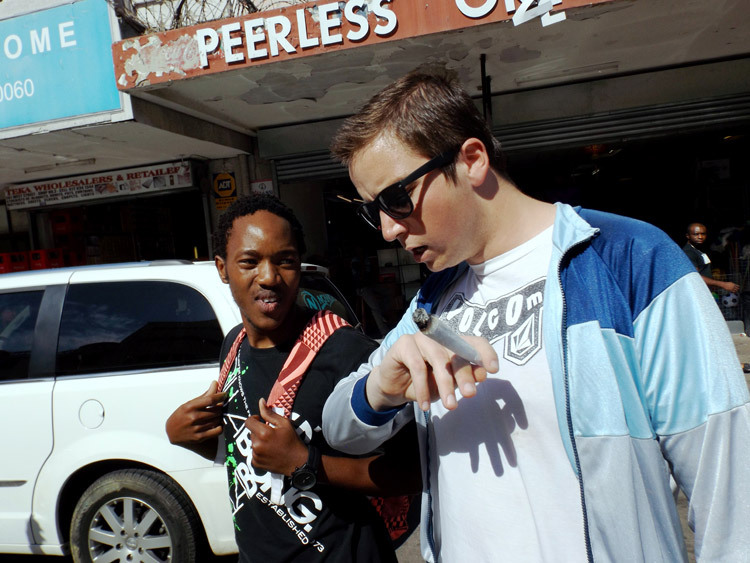 Durban is famous for spliff and apathy after all! The mighty law escorted the motley gathering with a combination of amusement and indifference, but eventually they stepped in when a fellow by the name of ‘Bobby Greenhash’ (Sheldon Cramer, 48) lit up an absurdly giant and conspicuous spliff – a spliff so large that it could have been entered into the Guinness World Records. Mr Greenhash was arrested and taken to CR Swart police station. He was released several hours later. Ironically, Mr Greenhash is involved in legal compliance and maritime law, so he’s not your average stoner. Although he also dabbles in the production of cannabis oil, which he sells to Harry and others in need of a dose. 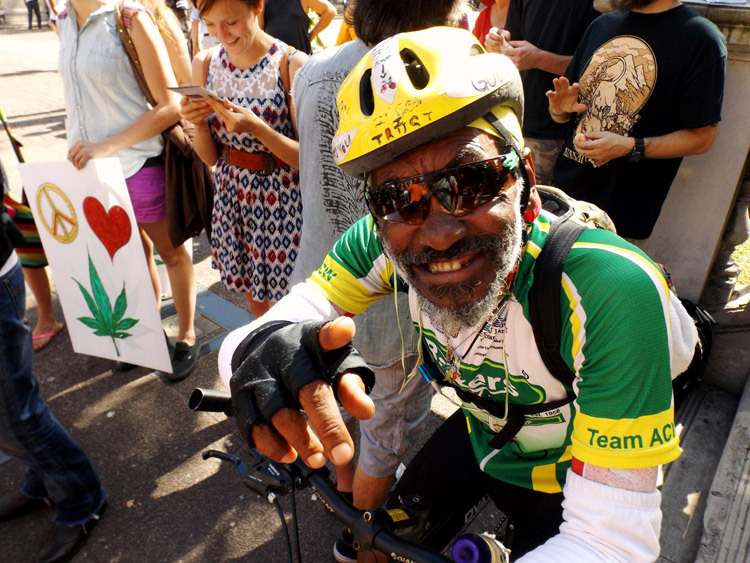 “As convener of the march I was disgusted with how the police were sent in like pit bulls,” raged Bow who has been fighting for the cause of legalizing marijuana for many years. She said that she hopes future protests will be free from police intervention. Although the turnout wasn’t what organisers would have hoped, it did gather momentum as random people from the public joined in when the march neared the City Hall. “I hope that one year we can fill West Street with people marching for the legalization of marijuana,” lamented Bow. 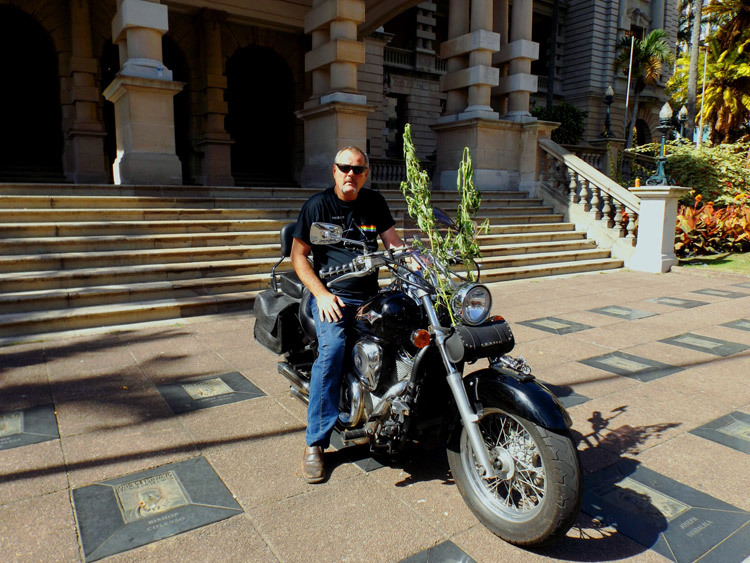 Once outside the City Hall, Harry Du Preez handed over a cannabis manifesto to members of the Durban SAPS amongst flamboyant stoners, one even sporting a motorbike with fresh dagga plants attached to the handlebars, turning the whole gathering into something of an informal circus parade. The police officers refused to comment for fear of losing their jobs. The infamous indigenous strain, Durban Poison, has made our coastal town famous among ganja smokers the world over. Hell, you can even buy Durban Poison from rude-boys in London Town or weedmen in New York. Now a small but resilient group of unlikely renegades feel it’s their democratic right to fight for Poison City’s ganja heritage. Is weed a harmless recreational pastime, a dangerous gateway drug, or the medical saviour of our modern era? 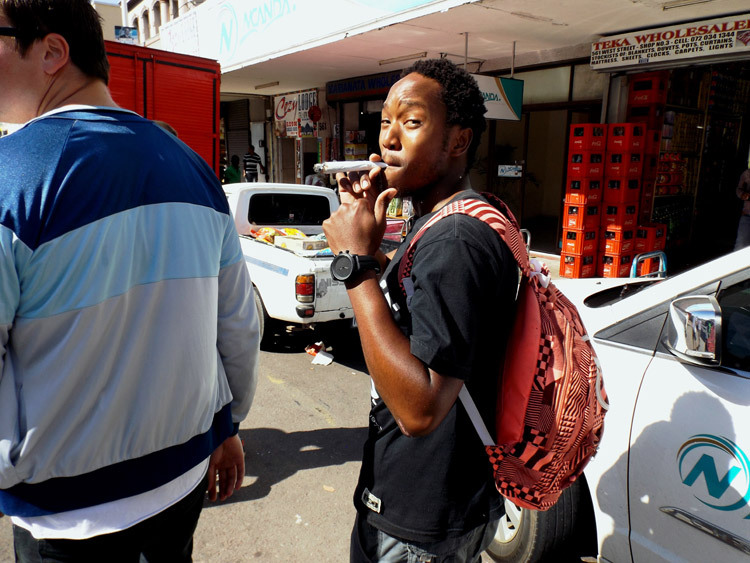 Some countries are starting to legislate in favour of the herb, but in South Africa the cause of decriminalizing marijuana is only just beginning to gain traction. Syd Kitchen was there in spirit. Oh look, it’s weed o’clock. A delivery for the mayor? “We love ganja and Red Bull!” – new-age hippies with wings. “Catch that hippie! 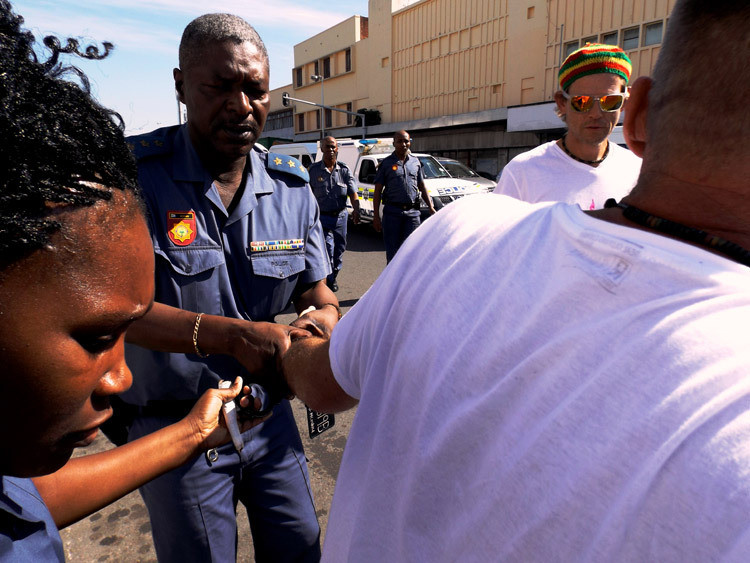 That spliff is WAAAAY TOO BIG!” – Officer Gumede. A well written and accurate article, with only one error that I saw. Harry is a diabetic, he receives his full plant extract Cannabis oil from another source. Bobby makes a honey infusion which would not be suitable if Harry is to stay off insulin. This whole fiasco is a joke! Still in court. I stated that Harry uses cannabis based oil, but not specifically mine. I may have misinterpreted the question from the reporter. It takes four armed policemen to apprehend one peaceful stoner. It would be funny if so many citizens weren’t being robbed and killed. How is his arrest going to help anyone. The courts are already overcrowded and inefficient. Everyone should light up at the same time and ask to be arrested. The apartheid government was an evil, no doubt, but is this government any different in the way it respects it’s citizens? What are you ou’s smoking ekse? When I decided to follow a more “in your face” protest tactic, I fully expected to be harrased by the law. This is the only way I can get them to listen, by showing that stoners are not just dumb arsed stoned hippies, but intelligent peeps that are tired of taking the crap. I am tired of taking the crap, I am tired of being branded a criminal, and treated as such by the police. I will no longer sit and watch the war on drugs make more victims. Sooner or later, an oppressed group will get tired of eating the crap and being treated even worse, so I am gonna try change it. I may not succeed, but I encourage peeps to stop living in fear and show them all a middle finger! Peace & Love! Good day people. Can someone tell me how to get hold of Bobby Hashgreen, I would like to buy some oil from this guy please. I smoked marijuana one…6 months later I was a crack addict living on the streets, sucking dicks for a fifty just so I could buy another rock! Just kidding, weed is great stuff. If I had heard about this march I might have been there. Guess I just need to get my ear closer to the ground. Just to avoid confusion it was me who introduced Harry du Plessis with oil,which is the same oil that saved me from MS hell. This oil works! We have enough land available in South Africa to grow cannabis into a cash crop, to heal the world. Bobby is a hero in my eyes! I suffer from epilepsy and use his oil. My seizures have stopped and I function better than I have in my whole life. It is people like him that is the voice of those who can’t be heard. Good luck and keep fighting the good fight Bobby!